APCERT offers different categories of membership/partnership for different types of organisations. Details of each category and application procedures are described in "APCERT Member & Partner Categories Policy" below. 1. The Asia Pacific Computer Emergency Response Team (APCERT) is a forum for national and non-national Computer Security Incident Response Teams (CSIRTs) and Computer Emergency Response Teams (CERTs) within the Asia Pacific region to foster information sharing and collaboration on cyber security. APCERT has relationships with a wide range of organisations within the Asia Pacific region and around the globe. 2. Operational Members form the core of the APCERT community – they are the national and leading CSIRTs and CERTs from across the Asia Pacific region(*1) that meet the following criteria, as stated in the Operational Framework. advise the APCERT SC, within a reasonable time period, if at any time it cannot meet the above criteria. 4. There is an expectation that Operational Members will be active participants in APCERT. At a minimum this includes participating in the AGM and/or APCERT Drill and/or contributing to the Annual Report. 5. There is an expectation that Operational Members will be active participants in APCERT to the extent possible, namely with contributions to the APCERT Annual Report and participation in the AGM and APCERT Drill which are the key elements of APCERT activities. As such, Operational Members are required to contribute to the APCERT Annual Report and should also participate in the AGM and/or APCERT Drill. 6. Operational Members have full access to all APCERT information sharing and collaborative platforms(*2) and initiatives and are eligible to participate in any (or all) of the APCERT Working Groups(*3). Operational Members also have the right to vote on APCERT operational matters and to stand for the Steering Committee and other elected positions after holding membership for one year. Each Operational Member has one (1) vote. 7. Separate to APCERT Operational Members, APCERT has three partnership categories – “Liaison Partner”, “Strategic Partner” and “Corporate Partner”, as stated in the Operational Framework. APCERT Partners do not have any voting rights but may observe and provide feedback on APCERT operational matters. Partners receive a standing invitation to the APCERT Annual Conference. 8. There are some CERTs/CSIRTs with which APCERT has – or would like to have – a formal relationship but which are not eligible for operational membership. These organisations include national and non-national CERTs/CSIRTs from outside the Asia Pacific region, and CERTs/CSIRTs that do not yet meet Operational Member joining requirements. agree and be able to protect information provided by APCERT and its members appropriately in line with the Traffic Light Protocol (TLP)(*4). The exchange of official contact details and the potential exchange of CERT-to-CERT operational information are at the core of the Liaison Partner relationship. Liaison Partnership allows a two-way flow of points of contact and information to support CERT/CSIRT operations. It is a mutual partnership based on the vision of helping create a safe, clean and reliable cyber space through global CERT-to-CERT collaboration. 10. As equivalent CERT organisations, APCERT Liaison Partners receive a standing invitation to attend the APCERT Annual General Meeting and Conference. They are also eligible to be invited to participate in the APCERT annual Drill and some APCERT Working Groups, at the discretion of the Working Group convenor and APCERT Steering Committee. Liaison Partners are also able to pursue other collaborative activities of mutual interest with APCERT, including the exchange of tools and techniques, cyber security exercises and capacity building activities such as training. The exchange of information between APCERT and its Liaison Partners occurs in accordance with the TLP. A Liaison Partner is an individual national CSIRT/CERT that principally or completely operates outside the geographic boundaries of APCERT and is not-for-profit and/or wholly or partly government funded, or are potentially capable of becoming an Operational Member but do not yet meet Operational Member requirements. Such entities become Liaison Partners because they wish to establish a formal relationship with APCERT and official points of contact for incident response, as well as to pursue information sharing and other collaborative activities with APCERT and its members. 11. Strategic Partners are government or not-for-profit organisations—not CERTs/CSIRTs—that provide cyber security or internet-related services. Strategic Partners include entities such as Internet registries, law enforcement agencies, network operators and collaborative cyber security groups. advise the APCERT SC, within a reasonable time period, if at anytime it cannot meet the above criteria. 15. The core element of the Corporate Partner relationship with APCERT is that they have ability to contribute to APCERT operations and activities. This contribution or support can come in the form of in-kind assistance such as training, seminars or presentations at APCERT events. It can also involve financial support, for example the APCERT Fellowship Program which provides assistance to selected APCERT members to attend the APCERT Annual General Meeting (AGM) and Conference, sponsoring the APCERT AGM and Conference or other related events. 16. 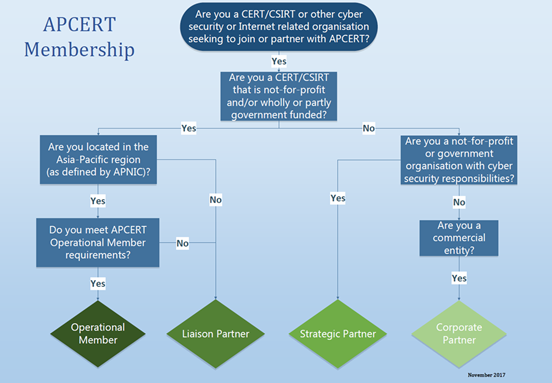 Corporate Partners are also able to share information and support other collaborative cyber security activities and initiatives with APCERT and its members, including capacity building. In addition, they are eligible to participate in some APCERT Working Groups, at the discretion of the Working Group convenor and the APCERT SC. be approved by unanimous APCERT SC decision. 18. New Operational Members are recorded in the minutes of the relevant SC meeting, which are circulated to all APCERT members. Applicants will be advised of the application outcome by the APCERT SC. If successful, the APCERT Secretariat will also notify all members of the new Operational Member via email. 19. APCERT Operational Members are also published on the APCERT public website. be approved by the SC under an MoU with APCERT. The MoU must be agreed unanimously by the SC and signed by the SC Chair on behalf of APCERT. The MoU must be countersigned by the partner organisation’s designated and authorised authority within that organisation. 21. APCERT Partners are also published on the APCERT public website. (*1) The Asia Pacific region refers to the Asia Pacific Network Information Centre’s (APNIC) geographic boundaries of 60th degree parallel (longitude). A list of the economies within the Asia Pacific region is listed on the APNIC web site. See: http://www.apnic.net/about-APNIC/organization/apnics-region. (*2) platforms include, for example, the closed APCERT Operational Membership email list, the APCERT Wiki (hosted by MyCERT) and the APCERT Data Exchanger (hosted by CNCERT/CC). (*3) List of current Working Groups can be found at https://www.apcert.org/about/structure/groups.html. (*4) APCERT’s use of the Traffic Light Protocol is codified in its Information Classification Policy, which is available at http://www.apcert.org/documents/index.html.